The Cuisinart CGPR-221 is a grill press that is handy tool to make grilling easier, faster, and healthier. Simply heat the press on grill and use it to grill the top side of food. The cast iron also presses away excess fat, making grilling healthier. The press weighs nearly 3 pounds and the comfortable wood handle makes it easy to move around the grill. 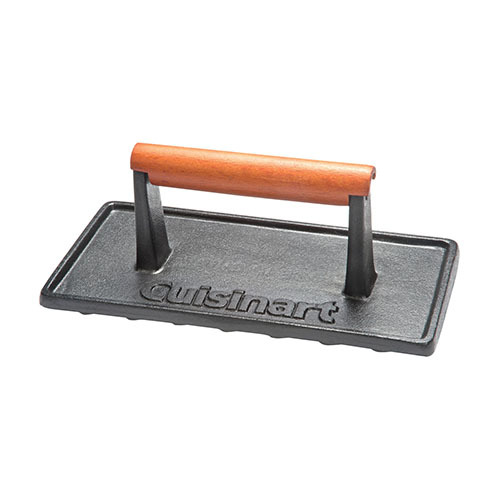 The Cuisinart Cast Iron Grill Press has many exciting features for users of all types. You can extend the lifetime of your Cuisinart Cast Iron Grill Press with the purchase of a FactoryOutletStore Factory Protection Plan. See the Cuisinart Cast Iron Grill Press gallery images above for more product views. 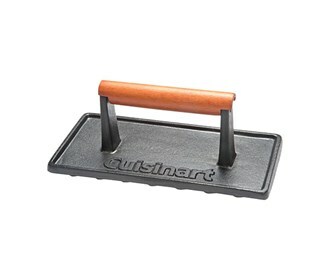 The Cuisinart Cast Iron Grill Press is sold as a Brand New Unopened Item.